Create walls, cubicles, and work/display areas with this 5 x 3' Standard Modular Panel from Best Rite. 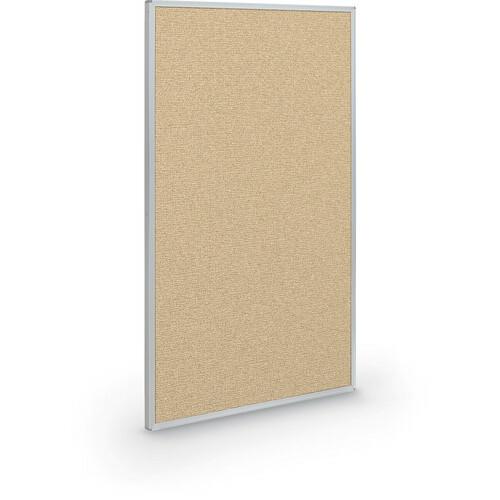 Constructed with a lightweight 1.25" honeycomb core lined with nutmeg tackable fabric and framed in durable anodized aluminum, the panel can be easily moved around and combined with other similar panels to assemble self-tailored configurations. The panel's frame is outfitted with slots to securely hold connectors (not included). Multiple connector options are available to enable two-way straight or 90° connections, or three-/four-way 90° connections between panels. Note: Connectors (available separately) are needed at the top and bottom of each panel-to-panel connection.